Named after Camelbak's own 23 time Boston marathon finisher, the Delaney offers a squeezable CamelBak Podium Bottle in an easily accessible, comfortable waist pack. Adventurers can hydrate for up to an hour or more with snacks and essentials at the ready. Ideal for a 10K the Delaney Race sports a 24 oz Podium Bottle and two 5 oz gel flasks that leave no excuses for not setting personal bests! 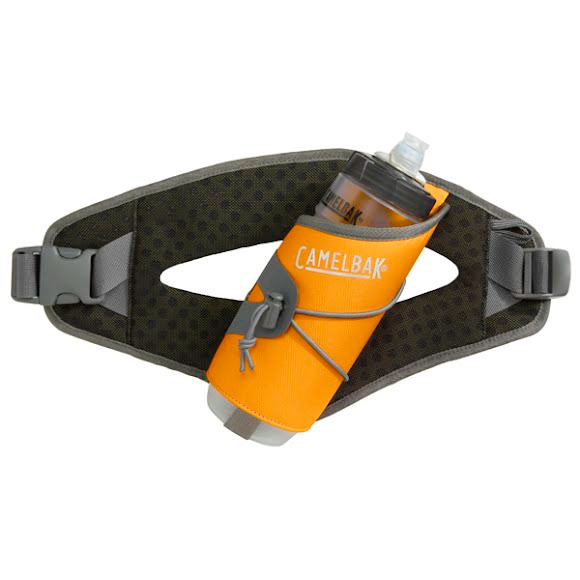 Named after Camelbak&apos;s own 23 time Boston marathon finisher, the Delaney offers a squeezable CamelBak Podium Bottle in an easily accessible, comfortable waist pack. Adventurers can hydrate for up to an hour or more with snacks and essentials at the ready. Ideal for a 10K the Delaney Race sports a 24 oz Podium Bottle and two 5 oz gel flasks that leave no excuses for not setting personal bests! Includes a 24oz CamelBak Podium bottle and 2 x 5 oz gel flasks. Quick-release loop for easy access to Podium Bottle on the move. Front and rear reflective hits for increased visibility and safety. Perforated foam with laminated mesh pack. Side cinch fit system with dual adjustablility. Step up to the Podium. The New CamelBak Podium Bottle incorporates Jet Valve, a revolutionary self-sealing valve into a taste-free bottle with a high flow rate. Lets you sip from any direction, or squirt to cool off on long rides. Eliminates the &apos;bite open, hip-slap shut&apos; steps. Made from medical-grade silicone, the Jet Valve eliminates splatter on your frame or jersey. Squeezable bottle offers more water when you need it.